The political debate between Marxism and Anarchism is one which has never been characterised by a very high degree of theoretical and intellectual clarity. In the hundred years since Marx's death, the debate between those who accept the ideas of Marx and those who accept the ideas of the anarchist founders has been fierce; at times it has been quite vicious and thoughtless. But it is one in which the issues involved have been primarily assumed rather than stated. Just curious, Anarcho, and I have no stake in this particular critique, but what do you consider a good critique of anarchism? What are your criticisms? l'll throw my two cents in here. One flaw of this argument is that the author draws upon a few texts. Then he proceeds under the assumption that these represent anarchist thought. But maybe the reality is more that anarchist thought is not one thing which comes from one person or one text like a Bible. l mean, maybe ask some anarchists whether or not they agree with everything Proudhon or Stirner has said. For example, the author says things like Stirner had no conception of class. Well... l think if you asked 100 anarchists with some basic knowledge of anarchist history about this, probably 90 percent of them would barely disagree and would also criticize Stirner in this regard. So, that might be a normal criticism of Stirner, but not of all anarchists. I think the only real ground worth fighting on between Marxism and anarchism is DotP. But I think the libertarian Marxist idea of DotP is the only one which could show itself as viable after the atrocities of the past century, and then Marxism becomes like platformist anarchism. DotP is not really an actual dictatorship, Johnny. Marx used it more as a figure of speech if anything (though I stand corrected). But in any case, the typical split between "Marxists" and anarchists is on the question of when the state will be abolish: immediately or will it wither away. I don't claim to know how Marx viewed the dictatorship of the proletariat but in my humble opinion the period of transformation between capitalism and communism is ongoing. It ebbs and flows as we rise (2008-2012) and as we are put down (now) but a new cycle of uprising inevitably comes around. It is our nature. As to the conflict between Marx's party and the party of Bakunin in the International, I think it has been overplayed and exploited by our enemies. Parts 2 and 3 of the audio recording cover these points in the discussion which is not transcribed. 2. An even longer ramble. It's very difficult to write a good critique of "anarchism" because there are so many disagreements on what the anarchist tradition is. For example, a class struggle anarchist would disagree that Max Stirner counts as an anarchist, whereas a "post-left" anarchist would reject the inclusion of many syndicalists. Marxists (and even some anarchists) usually tend to view it as a single line of thought with an established canon, which then splits into some different hyphenated schools of practice along the way. In other words, they want to see it like a mirror of Marxism. The reality however is more complicated and messy than that. The truth is that while there are many people described as anarchists from before the founding of the First International - William Godwin and Max Stirner for example - they never actually used that word to identify themselves. Their inclusion as anarchists is very much retroactive labelling. So to attack Stirner as an anarchist is in fact quite like attacking Feuerbach as a Marxist. They should at least stick to thinkers who self-identified explicitly with anarchism instead of theorists who were later claimed as part of the same tradition. 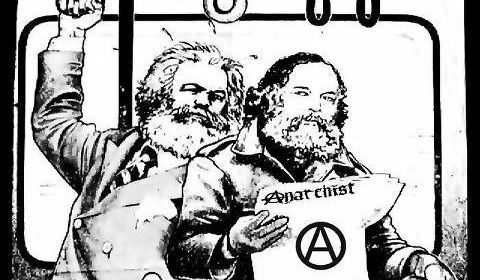 If trying to compare anarchism and Marxism (itself made up of many hyphenated -isms) it would be best to contrast two distinct schools of thought - say, Marxism-Leninism and anarcho-syndicalism, or autonomism and platformism - than to speak of anarchism and Marxism as those are two all-encompassing categories. Marx wrote of 'the party of anarchy, of socialism, of communism'. So for Marx, at least, it is one unitary movement of the working class. Hey. No I agree with you, I think DotP is in fact very similar to what Kropotkin called the "transition period" of 5 or so years, if I remember right. Marx thought DotP might take many different forms, the Paris Commune being his main example. That was what I was saying- there's no real ground between Marxism and class-struggle anarchism as far as I'm concerned other than the more individualistic/morality-focussed view of the situation in anarchism. I view myself as more of a libertarian Marxist but I'm not so well-read yet.